Does this come with PS/2 and VGA cables? I had a slight amount of static, I had assumed this would be something I'd just live with. On reading the manual, I noticed there was a setting to adjust the video gain. I used the auto adjust and it is now clear as if it were local. I am using the unit about 75' away, and it works great. This product worked exactly as advertised! I ran my cable, terminated the ends, plugged in the equipment, moved the monitor and it worked perfectly the first time, didnt have to set anything just hook it up and go! I highly recommend this product. I tried this umpteen times with different peripherals while following instructions, and zero success. An expensive paper weight! Good product and very good price. PROS: Works well and the price and best price I found for this type of device. I purchased two of these and was able to chain both of them together to achieve two remote terminals (~100ft away) and one local terminal to operate a single PC (all three terminals can operate the PC simultaneously). PROS: They are easy to setup, and they work flawlessly. Not to mention they are the cheapest ones you will find. Can be chained together to achieve multiple remote terminals. 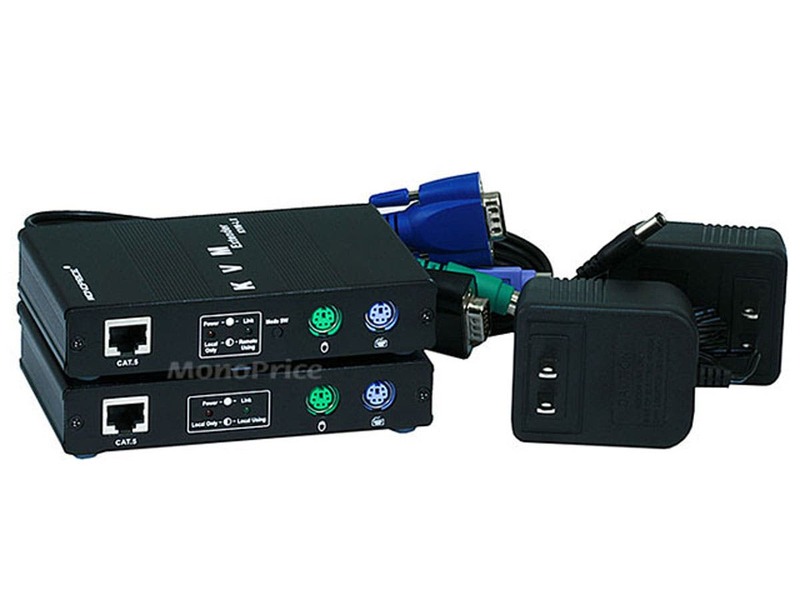 Local box does not require a power adapter, but the package does come with two power adapters. 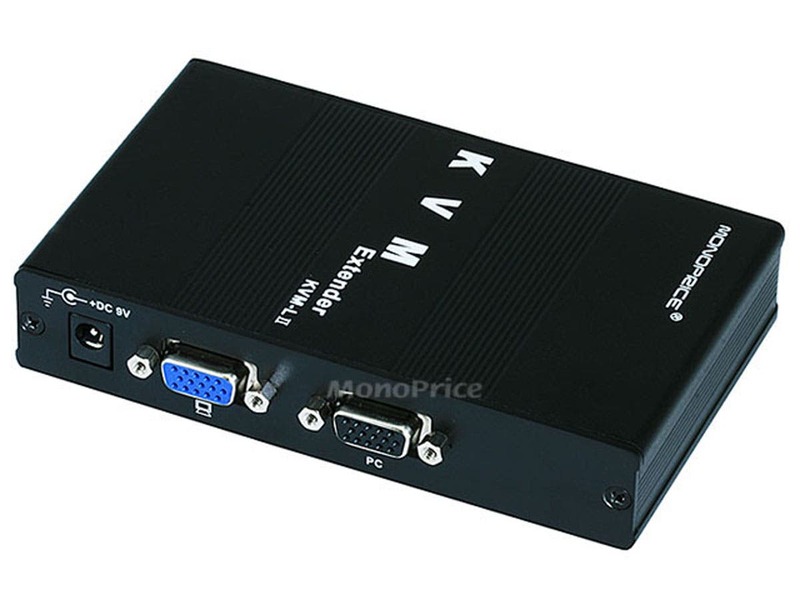 CONS: Price is still a bit high in my opinion Would be nice if the VGA ports and the PS/2 ports could be on the same side of the box. Would also be nice if they made a similar product that supported USB keyboards & mice. I installed this as a replacement to a previous one. When I installed it the video looked horrible and I wasn't impressed. I then returned to the instruction manual to find that you can adjust the video gain and equalizer through the remote kvm. Did so and it worked great! Was a nice surprise, previous KVM didn't have this. Worked as described. I even got this unit to work over CAT3 cable that was already in place between two buildings. Pros: A wonderful little gadget that allows a user to run a machine from 2 different places in the building. Easy to install, easy to use. Cons: Absolutely no USB support at all. If your computer does not have PS2 port integrated with the mb you will not be able to use the keyboard or mouse. 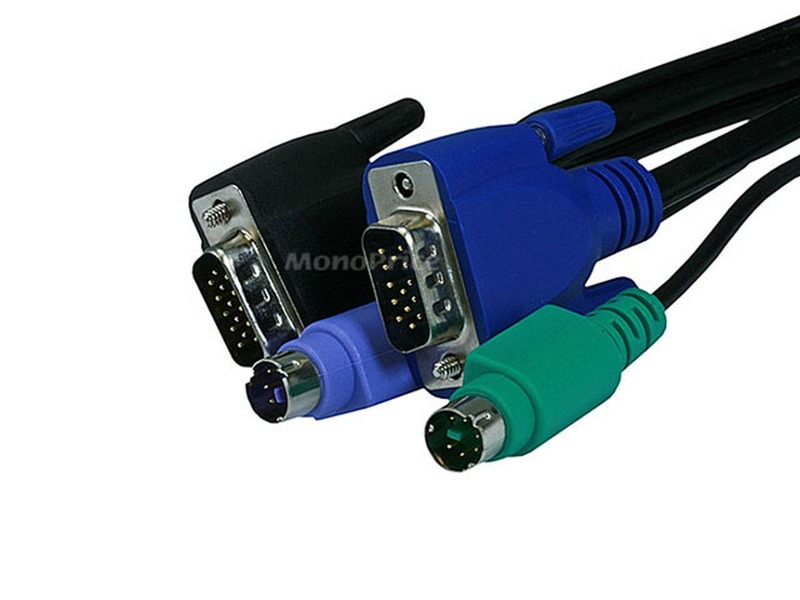 PCI to PS2 adapters will not work, neither will USB to PS2 adapters.